Student entry must be submitted by the instructor. Instructor must obtain written permission from the student (and parent/guardian if student is under the age of 18) to have the entry reproduced and distributed. Entry must include a digital image of the greeting card; portraying the card on display – NOT the design file. This image will be used in an entry display showcase. Accepted file formats are: .jpg .png and less than 10MB (can be uploaded as .zip). All GAERF Student Design Competition entries must be submitted by the instructor. 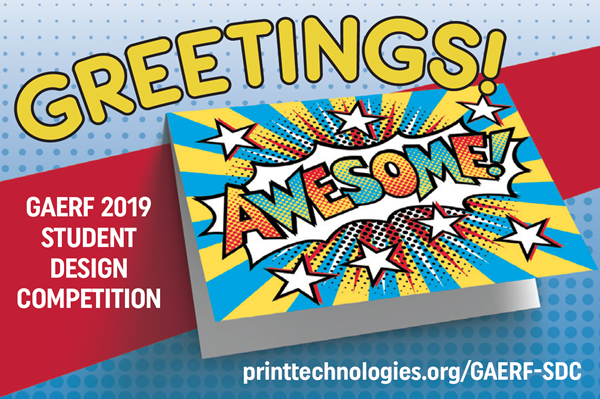 All entries become the property of the Graphic Arts Education and Research Foundation and the Association for PRINT Technologies. The entries may be reproduced and distributed, and will not be returned. Both the student and parent/guardian (if student is under the age of 18) have provided written permission for participation in the GAERF Student Design Competition. The entry is the work of the named student, contains no copyrighted materials or photos, and was completed during the 2018-2019 academic year. Instructor must check the box below to agree to the terms and conditions and e-sign where indicated.